Here is a selection of music recorded and produced by Monkey Marc in indigenous community workshops in the Barkly region, NT, and from Warlpiri communities in central Australia. Communities in these remote areas often don't have the facilities or opportunities to record music, although a lot of young people make music and play in bands. Over the years, Monkey has set up and recorded in makeshift studios in these communities, recording in old toilet blocks, abandoned youth centres, lounge rooms of motels and even on remote beaches with crocodiles. Sometimes there is sufficient funding to set up a studio and leave music equipment behind, after training the youth in how to use and maintain it. These workshops provide indigenous youth with the opportunity to record their bands and write new music, and also to learn how to record music. This allows them to express, record and share their stories through music and music videos. Recording studio, Ampilatwatja, Northern Territory. Barkly Desert Culture is a Barkly Regional Council youth program, focusing around digital media and music to tell stories from the Barkly region, Northern Territory, Australia. Music facilitators and workshops were run by Monkey Marc, Beatrice Lewis and Leo Ortega, and overseen by Sean Spencer. This compilation features music from the homelands of Utopia, Ali Curung, Elliot and Ampilatwatja in the Northern Territory. Monkey's work on the Barkly Desert Culture project for the Barkly Regional Council, NT, was recognised by a 2015 National Award for Local Government in the category of Arts Animates — excellence in community engagement and participation. 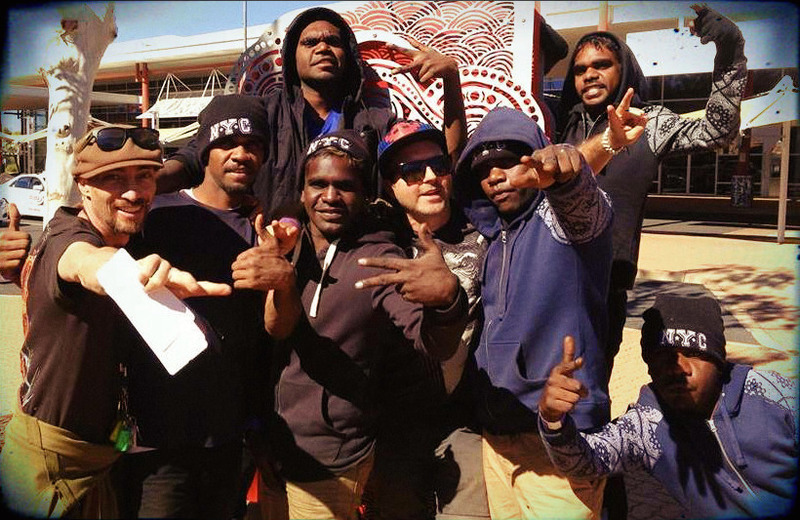 Red Sand Culture is a hip hop music and dance mentoring project delivered by Incite Arts in partnership with the Warlpiri Youth Development Aboriginal Corporation (Mt Theo Program). Workshops mentors include Monkey Marc, Elf Tranzporter, James Mangohig, Corey Mcgregor and Liam Monkhouse. Check out these great compilations of music from the central desert communities of Lajamanu, Yuendumu, Nyrripi and Willowra in the Northern Territory. Desert Sevens, E Town Boyz, Sean Spencer and Monkey Marc after the Wide Open Space performance May 2015. Utopia band recording a video, 2015. D7z making the film clip to "Make the Change"